CapacityPlus provided state-of-the-art expertise, models, tools, training, and analyses adapted to each context. These services helped countries move closer to having the right health worker in the right place with the right skills and support. The project worked with public, nonprofit, faith-based, and for-profit organizations contributing to better human resources for health. Through service and partnership, CapacityPlus accelerated progress toward national goals for improving maternal and child health, increasing access to family planning and reproductive health services, heightening access to HIV/AIDS services, and reducing the toll of malaria, tuberculosis, and other infectious diseases. CapacityPlus worked to integrate gender equality into each technical area, assisted faith-based organizations to strengthen their ability to manage human resources and provide high quality care to underserved populations, and strengthened the social service workforce to improve the lives of vulnerable children and families. Serving health workers, saving lives. 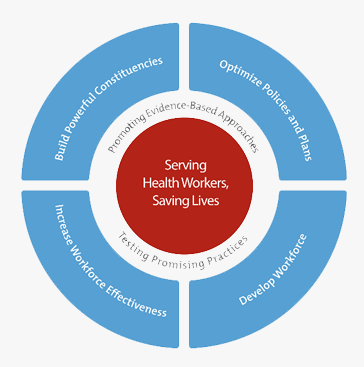 Our vision focused on saving lives and improving health through significant change in the health workforce. We placed health workers at the center of all our efforts.